Kuwait’s al-Rai daily says Lebanon-based group, Syrian army have created a joint military command, dividing potential war fronts. The Lebanon-based Shi’ite militant group Hezbollah and the Syrian army have initiated a significant military cooperation in joint preparation for the possibility of a future armed conflict with Israel, the Kuwaiti daily al-Rai reported on Monday. The report came as Syrian president Bashar Assad urged Lebanon’s Prime Minister Saad Hariri earlier Monday to support Hezbollah and maintain calm in the divided country. The al-Rai report also stated Syria’s contentment with Turkey’s recent announcement that it would ban Israeli warplanes from entering its airspace, since it prevents the possibility of an Israeli airstrike from that direction. 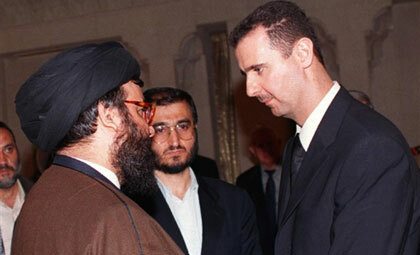 Earlier Monday, Syria’s Assad urged Lebanon’s leader to support Hezbollah and maintain calm in the country. Hariri has visited Damascus repeatedly this year in a sign of Syria’s renewed influence over Lebanon in the years since Damascus withdrew its military in 2005, ending a nearly three-decade hold on Lebanon. Hariri’s visits indicate that he needs Syrian support as his Western-backed coalition struggles at home. Syria backs the Lebanese militant group Hezbollah, which has a large role in Lebanon’s fragile national unity government. “Enemies are endeavoring to damage Lebanon’s solidarity and unity, but Lebanese’ resistance groups will thwart their plots and conspiracies with their tact and promotion of solidarity,” the Iranian president added.